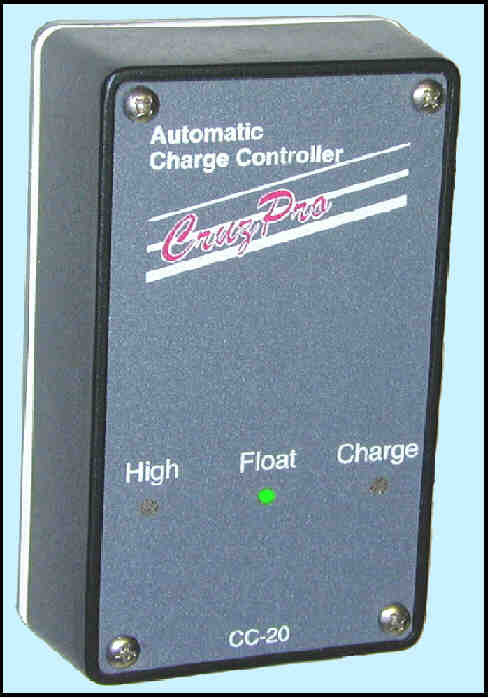 CruzPro charge controller and regulator with built-in high voltage alarms, low voltage disconnect, LVD, pulse-width-modulators, PWM, keep your batteries fully charged without fear of overcharging. 9.5 to 21 VDC (Unloaded), 8 amps max. 12 VDC nominal, 0.012 amps typical average current drain. Built-in overvoltage LED. Can be connected to optional External 105 dB Loud Alarm (LA-20). Lower and Upper trip points are both independently adjustable. Lower: 11.5 to 14.5 VDC, Upper: 13.5 to 16.5 VDC (factory set at 13.1 and 14.4 VDC). Handles wet, gell and NiCad batteries. Temperature compensated to an accuracy of better than +/-0.05 VDC. 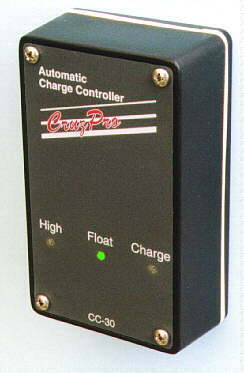 The CC-20 Automatic Charge Controller senses battery voltage and connects/disconnects your charging source (solar panels, dumb charger) depending on the battery voltage. The CC-20 enables you to leave your charging source connected permanently without fear of damaging overcharges or excess electrolyte loss. You are assured you have a fully charged battery whenever you need it. Three front panel LEDs show you what the CC-20 is doing at all times: in "Charge" mode, "Float" mode, or if your battery is in an overcharged "High" condition. The lower and upper trip limits are factory preset at 13.1 and 14.4 VDC but can easily be adjusted from 11.5 to 14.5 VDC (low limits) and 13.5 to 16.5 VDC (high limits) thereby covering wet, gell and Ni-Cd batteries. Accuracy is maintained to +/- 0.05 VDC over the full operating temperature range. The CCA-20 handles up to 8 amps at an efficiency of 99.8% at 8 amps. The CC20 has built-in user adjustable battery over-voltage detection that activates an alarm LED. The alarm output signal can also be connected to the optional LA-20 External Multi Alarm. The LA-20 has provisions for connecting up to six instruments and provides an amazing 105 dB of volume. 9.5 to 21 VDC (Unloaded), 20 amps max. 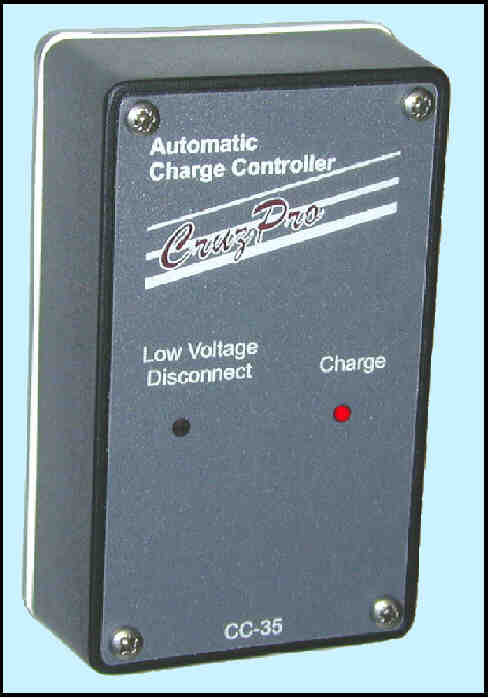 The CC-30 Automatic Charge Controller senses battery voltage and connects/disconnects your charging source (solar panels, dumb charger) depending on the battery voltage. The CC-30 enables you to leave your charging source connected permanently without fear of damaging overcharges or excess electrolyte loss. You are assured you have a fully charged battery whenever you need it. Three front panel LEDs show you what the CC-30 is doing at all times: in "Charge" mode, "Float" mode, or if your battery is in an overcharged "High" condition. The lower and upper trip limits are factory preset at 13.1 and 14.4 VDC but can easily be adjusted from 11.5 to 14.5 VDC (low limits) and 13.5 to 16.5 VDC (high limits) thereby covering wet, gell and Ni-Cd batteries. Accuracy is maintained to +/- 0.05 VDC over the full operating temperature range. The CCA-30 handles up to 20 amps at an efficiency of 99.9% at 20 amps. The CC30 has built-in user adjustable battery over-voltage detection that activates an alarm LED. The alarm output signal can also be connected to the optional LA-20 External Multi Alarm. The LA-20 has provisions for connecting up to six instruments and provides an amazing 105 dB of volume. 7.5 to 30 VDC (Unloaded), 8 amps max. Built-in PWM Charge LED and Low Voltage Disconnect (LVD) LED. 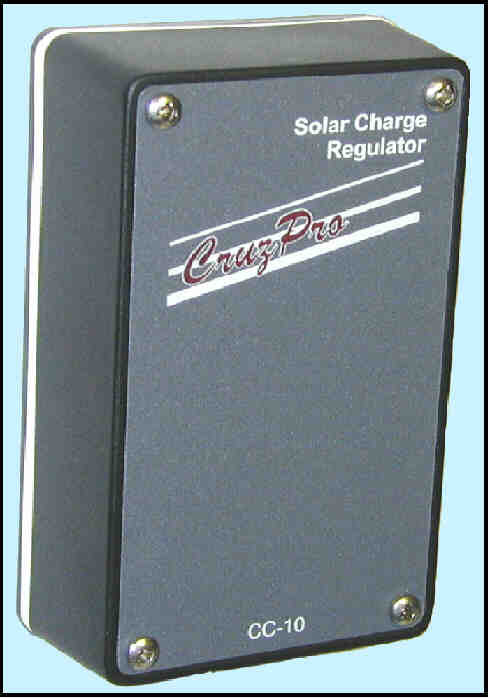 The CC35 Automatic Charge Controller is a three step regulator that senses battery voltage and adjusts the regulation to deliver a bulk, absorption and float voltage from your solar panels or dumb battery charger. The CC35 enables you to leave your charging source connected permanently without fear of damaging overcharges or excess electrolyte loss. You are assured you have a fully charged battery whenever you need it. The CC35 is a true Pulse Width Modulated (PWM) charger that keeps the battery voltage at the prescribed charging voltage irregardless of the load current. The CC35 bulk charges your battery to 14.5 VDC and keeps it at that absorption voltage for 30 minutes. After 30 minutes the CC35 automatically reduces the charging voltage to 13.6 VDC and maintains that float voltage. If the power demand from the battery exceeds the solar panel supply ability and the battery voltage falls below 12.5 VDC, the CC35 will re-enter the bulk charge mode and recharge the battery to 14.5 VDC before dropping back into float. A built in Low Voltage Disconnect (LVD) circuit automatically removes the load from your battery if battery voltage falls below 12.5 VDC for more than 1 second. This keeps the battery from going into a deep state of discharge if the charging source is unable to keep up with demand. The built-in time delay prevents the LVD circuit from enabling or disabling on short transients caused by motor start currents, etc. Two front panel LEDs show you what the CC35 is doing at all times: The "Charge" LED reflects the state of the PWM output (brighter for more output, more dim for less output and blinks once per two seconds when no charge is being delivered (battery fully charged). 7.5 to 42 VDC (Unloaded), 6 amps max. 13.6 or 27.2 VDC nominal, 0.012 amps typical average current drain. The CC10 Automatic Charge Controller is a voltage regulator that senses battery voltage and adjusts the regulation to deliver a fixed 13.6 VDC or 27.2 VDC float voltage (depending on model) from your solar panels or dumb battery charger. The CC10 enables you to leave your charging source connected permanently without fear of damaging overcharges or excess electrolyte loss. You are assured you have a fully charged battery whenever you need it. The CC10 is a true Pulse Width Modulated (PWM) charger that keeps the battery voltage at the prescribed charging voltage irregardless of the load current. The CC10 maintains a fixed charging voltage to 13.6 VDC or 27.2 VDC (depending on model) and maintains that float voltage for maximum battery life.